I went to check out the beach this past holiday Monday and there were more fishermen than fish. There were reports of one or two getting caught on gear but other than that things are quiet. I can come up with a few theories as to why the fish are not there in numbers but we will never be 100% right so lets hope the coho show up sooner than later and we can spend our time fishing rather than theorizing. There are a few fishermen that fish everyday on the beach starting in June and they have only hooked 5 to date. We have to be hopeful and remember again any day this could change and next thing you know there are hundreds of coho jumping and fining in the estuary. The results of fisheries are never fully revealed until the end of the season. 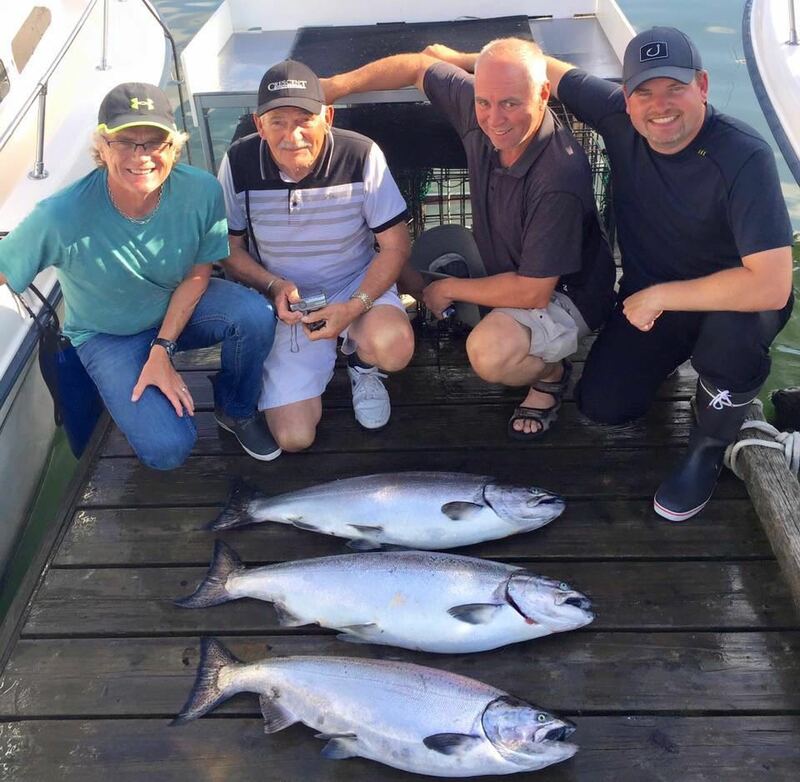 If you’re planning on heading out to try your luck the tides are not in the favour for the fly fishermen until August 13th, if you fish gear then off the jetty or around it is still possible. I hope to have a more positive report for next week. 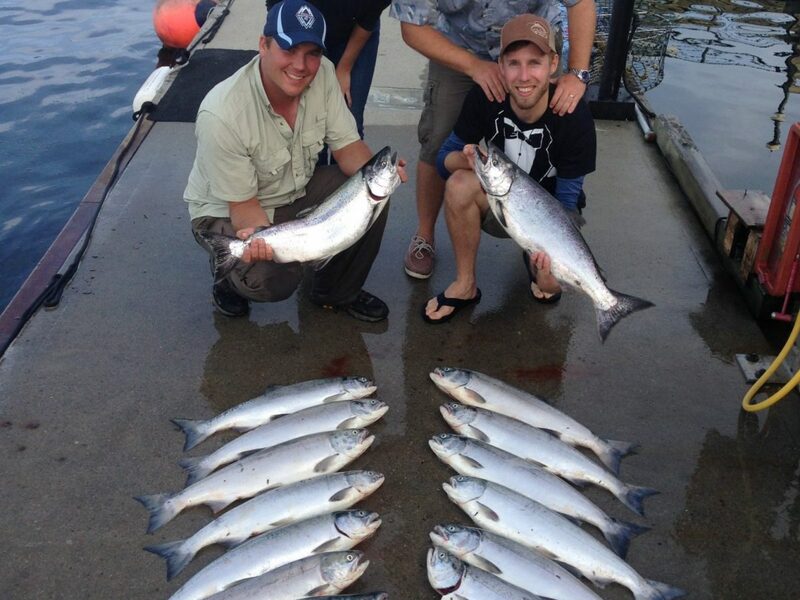 This past week we saw some decent coho fishing off West Vancouver but it has been hot and cold. As usual the best fishing for coho has been early in the morning before it gets too sunny. 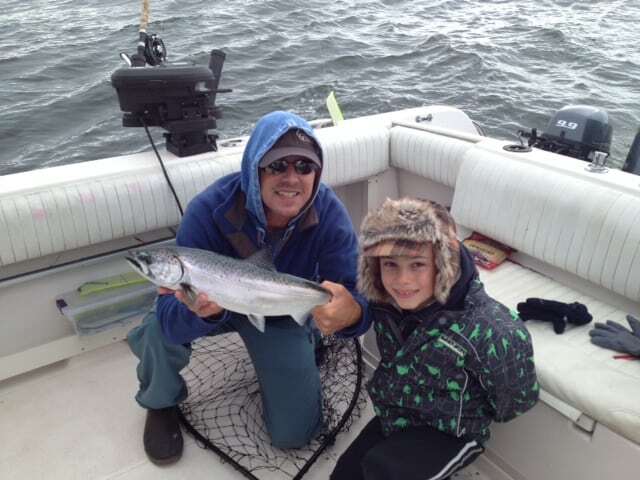 Aiden and his first chinook released at Point Atkinson with Captain Eddie. There has been some chinook off the Bell, T 10 and Sandheads but nothing consistent as of yet. The best depths for these chinook is 30 – 80 on the rigggers and as usual bait is best in glow teaser heads with glow flashers like the Salty Dawg. 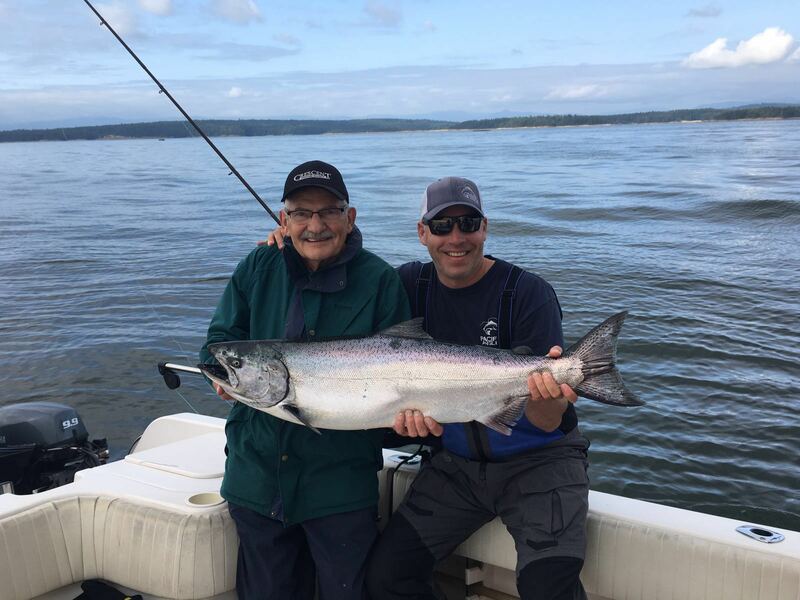 Guest Cal and guide Jason with an early morning chinook. We have been into some nice chinook at Thrasher and Nanaimo as well. These fish are deep. We’re running our riggers 180 – 240 feet. Double glow flashers and chartreuse splatter back hootchies have been producing well. Some nice chinook from Gabriola and Nanaimo.